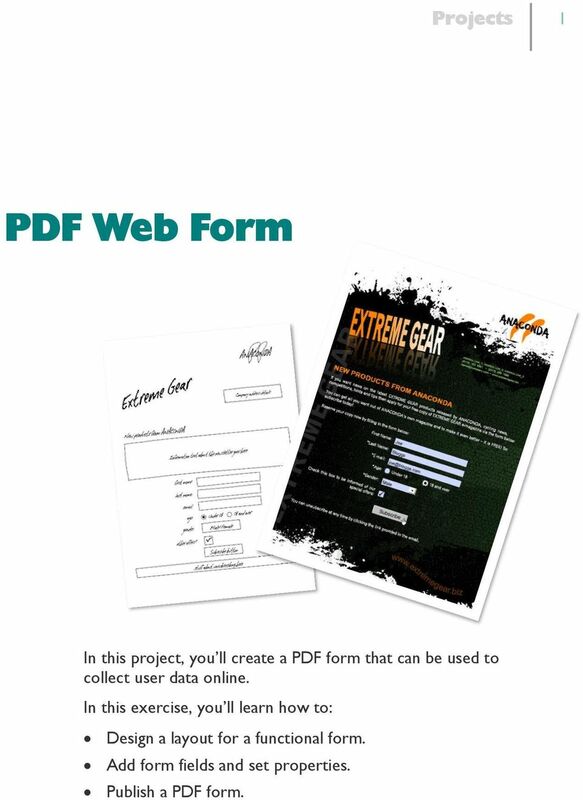 Download "PDF Web Form. Projects 1"
1 Projects 1 In this project, you ll create a PDF form that can be used to collect user data online. In this exercise, you ll learn how to: Design a layout for a functional form. Add form fields and set properties. Publish a PDF form. 3 Projects 3 We drafted out the form design illustrated here. All we need to do now is recreate it in PagePlus. Let s get started... To open the workspace document 1 On the File menu, click Open... 2 In the dialog, browse to the Workspace folder, select anaconda.ppp and click Open. The document opens in the workspace. 3 Next, on the File menu, click Save As... 4 Name the document PDF form.ppp and click Save. Layout aids The document has been set up using a 5 x 5 layout grid. If you can t see the grid, on the View menu, ensure that Trimmed Mode is unselected and that Guide Lines are selected. This will help you to position the elements. Now we re ready to start creating our form. 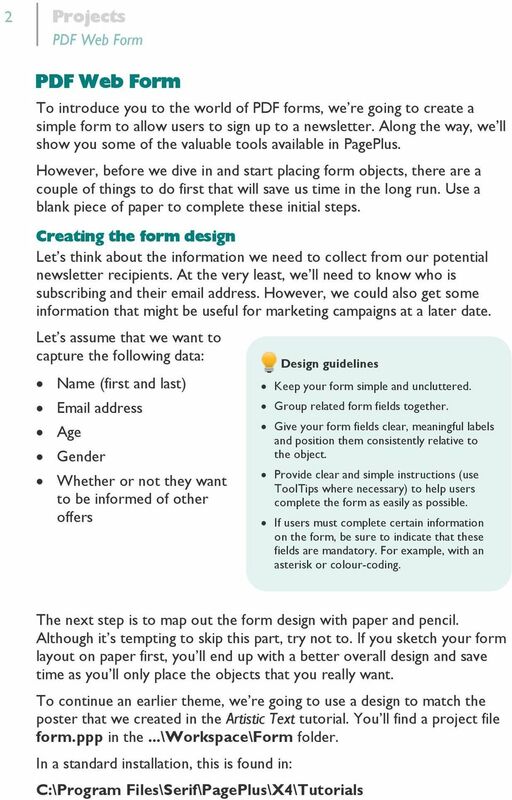 Creating the form text and labels The form we ve designed has two distinct object types: text objects (information and labels blue) and form objects (for user data red). We ll add the text objects first. We ll assume that you re already familiar with using text objects so we ll summarize this section. 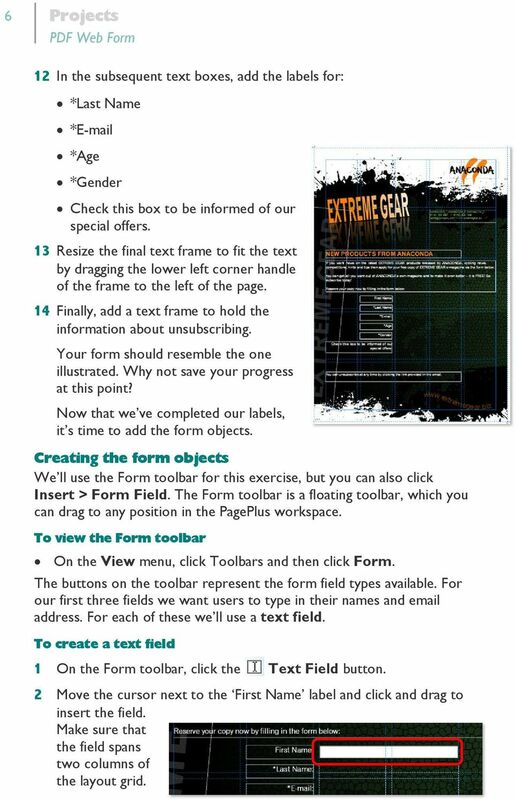 If you need more help with any of the steps, see the Artistic Text and Frame Text tutorials, refer to the How To tab or see online Help. 4 4 Projects To add the title and information text 1 On the Tools toolbar, click the Standard Text Frame tool. 2 Click and drag on the page to place a text frame approximately 1cm high and 14.7 cm (4 columns) wide. 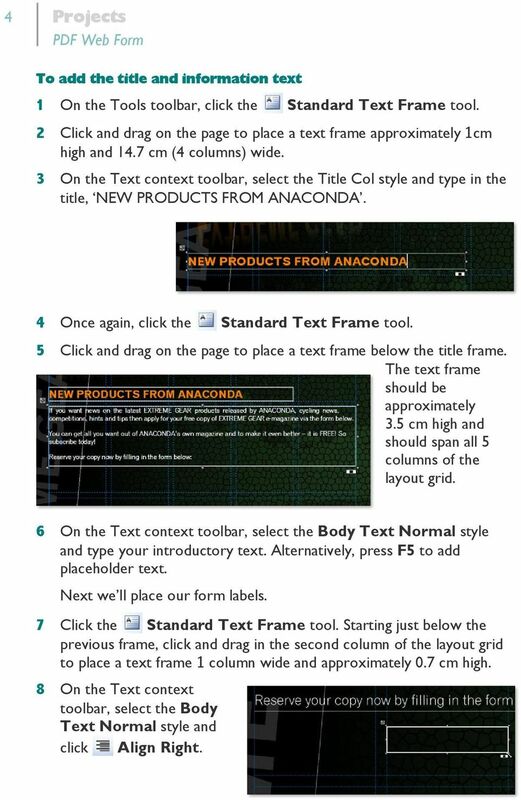 3 On the Text context toolbar, select the Title Col style and type in the title, NEW PRODUCTS FROM ANACONDA. 4 Once again, click the Standard Text Frame tool. 5 Click and drag on the page to place a text frame below the title frame. The text frame should be approximately 3.5 cm high and should span all 5 columns of the layout grid. 6 On the Text context toolbar, select the Body Text Normal style and type your introductory text. Alternatively, press F5 to add placeholder text. Next we ll place our form labels. 7 Click the Standard Text Frame tool. Starting just below the previous frame, click and drag in the second column of the layout grid to place a text frame 1 column wide and approximately 0.7 cm high. 8 On the Text context toolbar, select the Body Text Normal style and click Align Right. 5 Projects 5 Dynamic Guides To easily line up multiple objects, why not turn on Dynamic Guides? Click the arrow on the Snapping button. From the flyout menu, select Dynamic Guides. For more information, see online Help. From our form design, we know that we need 6 form items. Before we type our first label name, let s save ourselves some effort by using the Replicate dialog to make copies our newly created text box. 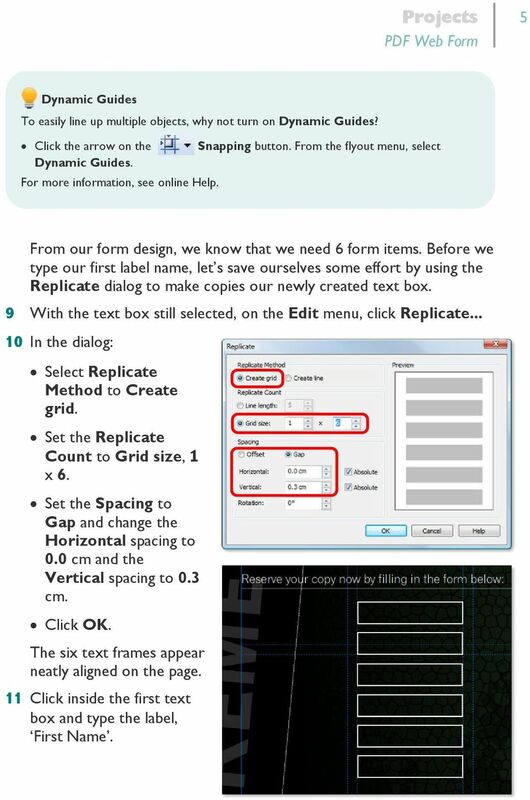 9 With the text box still selected, on the Edit menu, click Replicate In the dialog: Select Replicate Method to Create grid. Set the Replicate Count to Grid size, 1 x 6. Set the Spacing to Gap and change the Horizontal spacing to 0.0 cm and the Vertical spacing to 0.3 cm. Click OK. The six text frames appear neatly aligned on the page. 11 Click inside the first text box and type the label, First Name. 6 6 Projects 12 In the subsequent text boxes, add the labels for: *Last Name * *Age *Gender Check this box to be informed of our special offers. 13 Resize the final text frame to fit the text by dragging the lower left corner handle of the frame to the left of the page. 14 Finally, add a text frame to hold the information about unsubscribing. Your form should resemble the one illustrated. Why not save your progress at this point? Now that we ve completed our labels, it s time to add the form objects. 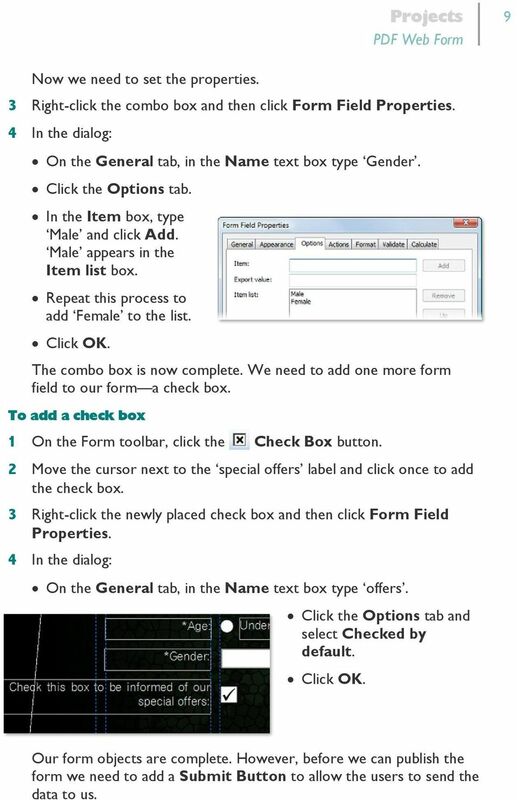 Creating the form objects We ll use the Form toolbar for this exercise, but you can also click Insert > Form Field. The Form toolbar is a floating toolbar, which you can drag to any position in the PagePlus workspace. To view the Form toolbar On the View menu, click Toolbars and then click Form. The buttons on the toolbar represent the form field types available. For our first three fields we want users to type in their names and address. For each of these we ll use a text field. To create a text field 1 On the Form toolbar, click the Text Field button. 2 Move the cursor next to the First Name label and click and drag to insert the field. Make sure that the field spans two columns of the layout grid. 7 Projects 7 Text field properties Each text field can have its properties customized. To do this, right-click the field and then click Form Field Properties. Within the dialog, you can adjust settings such as: Give a unique name to the field. Add a ToolTip to give the user information about the data field. Format the line around the text box, and the text that the user types into the box. Limit the number of letters that can be typed into the box. For more information see online Help or the screen tutorial, Creating a PDF Expenses Form. 3 Right-click the text field and then click Form Field Properties. 4 In the Name text box, type First_Name. Click OK. 5 Repeat steps 1 and 4 to add two more text fields next to the Last Name and labels. Rename the boxes Last_Name and . Next we need to add a form field for the age range. Although we could use a text field and get the user to type in their age, we don t need to be that exact. All we need to know is whether the user is under 18 or 18 and over. For this, we can use a radio button. To add a radio button 1 On the Form toolbar, click Radio Button. 2 Move the cursor next to the Age label and click and drag to insert the radio button. (If you press Shift while dragging, the aspect ratio will be maintained.) 3 On the Transform tab, set the width and height to 0.7 cm. To insert a second button, we can copy the first. 4 Press and hold the Ctrl key while clicking on the first button and drag it to the right. An exact copy is created. 8 8 Projects Radio button properties Radio buttons have special properties that include the Field Group. This allows buttons that belong to the same group to work in a mutually exclusive way, ie. only one button can be selected at a time. For more information about this and other radio button properties, see online Help or the screen tutorial, Creating a PDF Expenses Form. 5 Release the Ctrl key and position the button in line with the first with a grid column between the two. 6 Right-click the first radio button and then click Form Field Properties. 7 In the dialog, in the Name text box, type Under_18. Click OK. 8 Right-click the second radio button and then click Form Field Properties. 9 In the dialog, in the Name text box, type 18+. Click OK. The default properties of the radio buttons will suit our needs for this simple form. However, we do need labels to tell the user what the buttons are for! 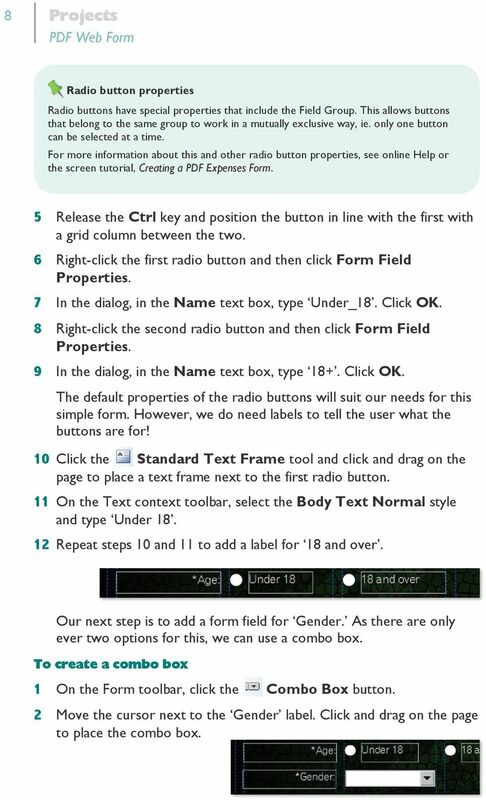 10 Click the Standard Text Frame tool and click and drag on the page to place a text frame next to the first radio button. 11 On the Text context toolbar, select the Body Text Normal style and type Under Repeat steps 10 and 11 to add a label for 18 and over. Our next step is to add a form field for Gender. As there are only ever two options for this, we can use a combo box. To create a combo box 1 On the Form toolbar, click the Combo Box button. 2 Move the cursor next to the Gender label. Click and drag on the page to place the combo box. 9 Now we need to set the properties. Projects 9 3 Right-click the combo box and then click Form Field Properties. 4 In the dialog: On the General tab, in the Name text box type Gender. Click the Options tab. In the Item box, type Male and click Add. Male appears in the Item list box. Repeat this process to add Female to the list. Click OK. The combo box is now complete. We need to add one more form field to our form a check box. To add a check box 1 On the Form toolbar, click the Check Box button. 2 Move the cursor next to the special offers label and click once to add the check box. 3 Right-click the newly placed check box and then click Form Field Properties. 4 In the dialog: On the General tab, in the Name text box type offers. Click the Options tab and select Checked by default. Click OK. Our form objects are complete. However, before we can publish the form we need to add a Submit Button to allow the users to send the data to us. 10 10 Projects PDF forms are only useful when you can collect the data. A good way to use this is to use the Submit Button. When the user clicks the button, the data is sent to either Serif Web Resources or to your own Web server. 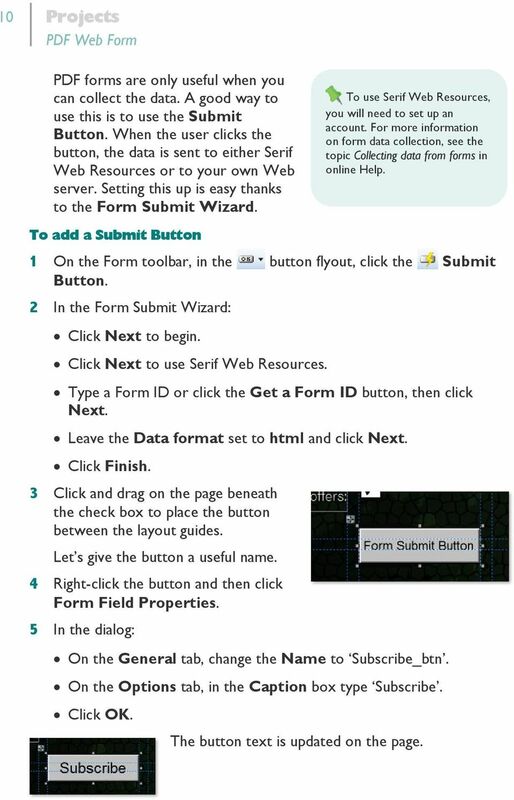 Setting this up is easy thanks to the Form Submit Wizard. To use Serif Web Resources, you will need to set up an account. 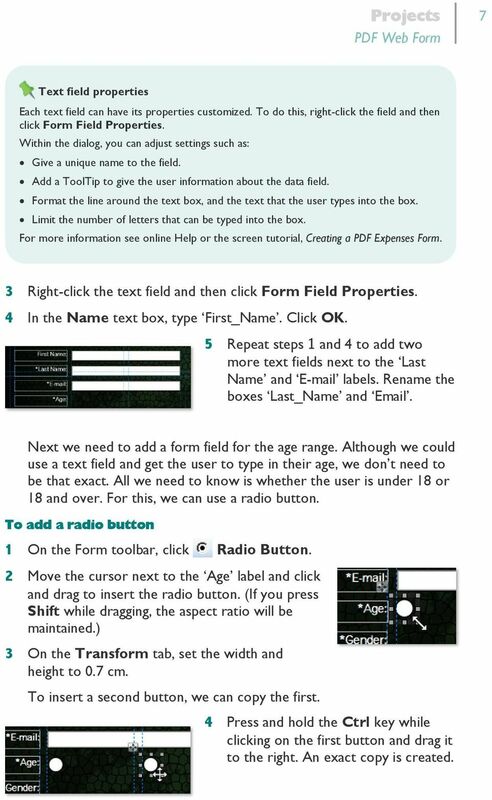 For more information on form data collection, see the topic Collecting data from forms in online Help. To add a Submit Button 1 On the Form toolbar, in the button flyout, click the Submit Button. 2 In the Form Submit Wizard: Click Next to begin. Click Next to use Serif Web Resources. Type a Form ID or click the Get a Form ID button, then click Next. Leave the Data format set to html and click Next. Click Finish. 3 Click and drag on the page beneath the check box to place the button between the layout guides. Let s give the button a useful name. 4 Right-click the button and then click Form Field Properties. 5 In the dialog: On the General tab, change the Name to Subscribe_btn. On the Options tab, in the Caption box type Subscribe. Click OK. The button text is updated on the page. 11 Projects 11 That s it, your form is complete! To check your form you ll need to publish it to PDF (it s also a good idea to save your form if you haven t done so already). Let s look at this now. 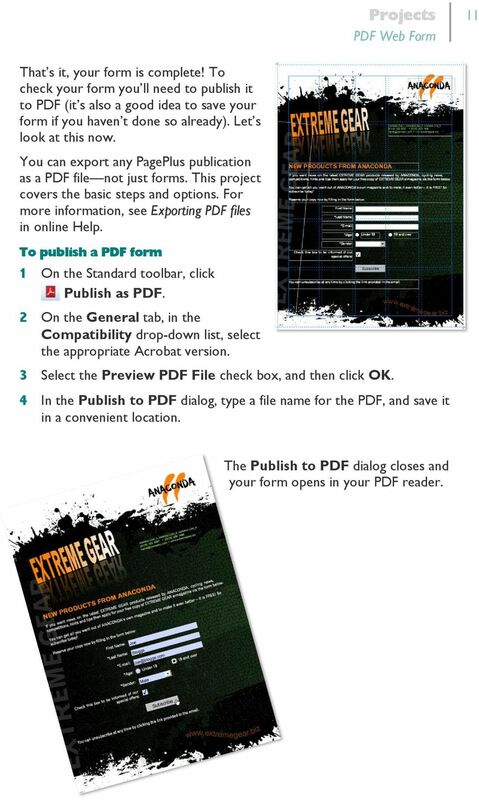 You can export any PagePlus publication as a PDF file not just forms. This project covers the basic steps and options. For more information, see Exporting PDF files in online Help. 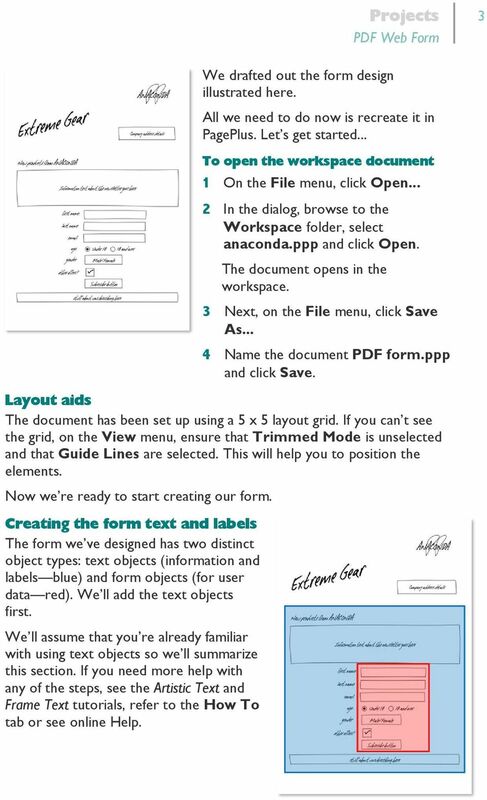 To publish a PDF form 1 On the Standard toolbar, click Publish as PDF. 2 On the General tab, in the Compatibility drop-down list, select the appropriate Acrobat version. 3 Select the Preview PDF File check box, and then click OK. 4 In the Publish to PDF dialog, type a file name for the PDF, and save it in a convenient location. The Publish to PDF dialog closes and your form opens in your PDF reader. 12 12 Projects Now that you ve finished your form, the final step is to create a link to it from a web page and upload it to your website. For more information on this and other web publishing features in PagePlus, see the section, Producing web pages in online Help. Your work is not finished yet you still need to check your form to make sure that it works in the way you expect. 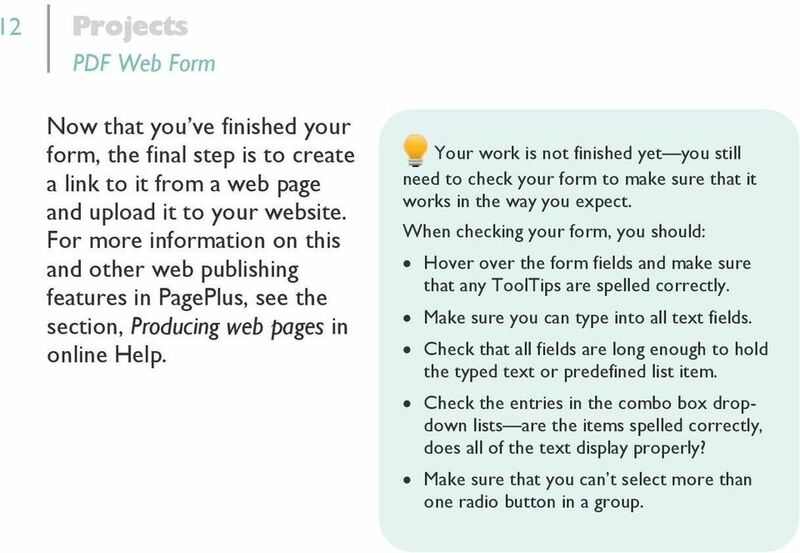 When checking your form, you should: Hover over the form fields and make sure that any ToolTips are spelled correctly. Make sure you can type into all text fields. Check that all fields are long enough to hold the typed text or predefined list item. Check the entries in the combo box dropdown lists are the items spelled correctly, does all of the text display properly? Make sure that you can t select more than one radio button in a group. Part II Acrobat 8 Professional Exporting Images There will be times when images will need to be exported out of a PDF document and saved as a file type in which it can be used in a different application. Quick Guide. pdoc Forms Designer. Copyright Topaz Systems Inc. All rights reserved.